Ready to jump into Spring? In February it's easy to get caught up in the reds and pink and purples of the season but for this week's board we're switching straying from the typical colors you'd expect and instead going for a cooler vibe. Do you love mustard and gray together but aren't sure how to make it more "Spring" friendly? 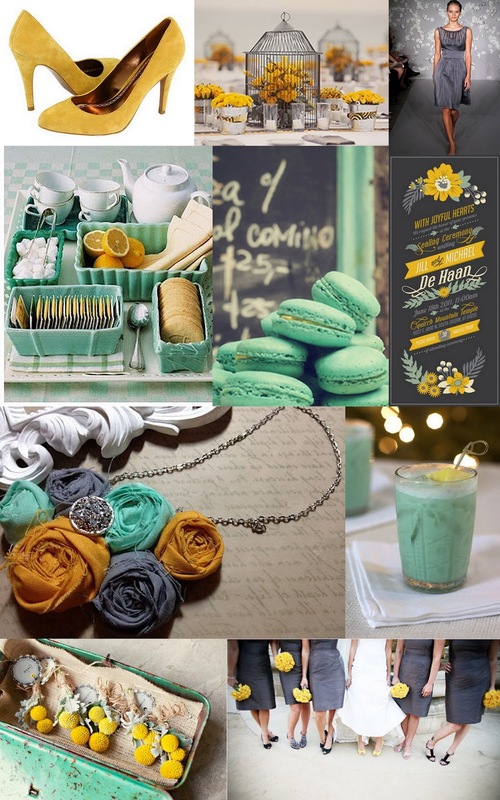 If so, just add some minty pastel green and you'll be all set for a modern and bright spring wedding. Or, try pairing a minty green top with a mustard skirt for some super stylish work attire. Lovely--sophisticated and not girly at all. I think I found my colors for my wedding! I LOVE mustard and grey together, so thanks for showing me how to do it without being too mod. Ohmygoodness I love this! Never would think to pair these colors together.